Jesus is Here. Jesus is Near. • Run Hard. Rest Well. Jesus is Here. Jesus is Near. One early morning, a week before Thanksgiving, Anna slid into a seat next to me at our kitchen table. Before I could respond, she placed a hand written sheet of paper in front of me, and with her eyes, and a nod of the head, indicated she wanted me to read it. Just last night I had held Anna tight in a long hug as tears puddled in her eyes. The list before me was long and varied. The play (she would soon be performing), the other kids’ lines, calculus class, scholarships, the political divide in our country . . . The list of 18 things detailed the weight she was shouldering. But, each concern was carefully crossed out. Off to the right, in large letters she wrote. Is your list long? Complex? Never-ending? Impossible to comprehend, much less bear? Jesus came for lists like these, and the weary hearts that go with them. So we don’t have to be afraid. Thank you, Brenda, and thank Anna for me.From the mouths of babes.I am filled with much fear, all of which I have no control of.But Jesus is here. I will thank Anna. That precious moment with her will likely be THE highlight of my Christmas celebration. Our lists are long. Our Jesus is BIG — and He is in the midst of every aspect of our lives. May we have eyes to see — this Christmas! Thank you for sharing these words of encouragement especially at this time of the year when we are stressed and not celebrating and seeing clearly the real reason of Christmas. 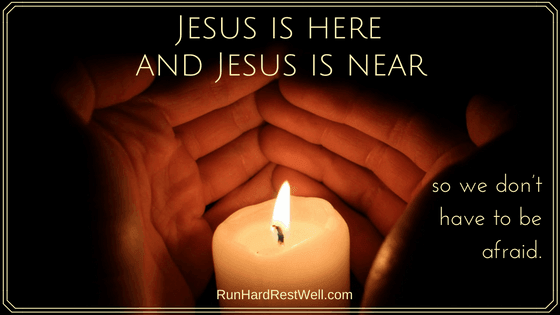 We need to remember Jesus is near all the time – no matter what we have in our life. At every twist and turn on the journey to the manger, let’s cheer each other on! God’s peace and joy be yours each day. I’ve been finding in recent weeks and months that God’s most profound revelations and solutions have come in the deepest, most desperate times of darkness. Indeed, He does set a table before us in the midst of our enemies. Jesus sets a table and it is a feast (!) … an Isaiah 25:6-9 mountain top feast. And we are never, ever the same when we see him, find him in these dark, dark places. Oh how my eyes are puddling now. To this, I add my YES! If I believe God is Sovereign, and I do, then nothing, NOTHING, is too big for Him. Nothing is out of His control. In the night, when the enemy stalks out hearts and minds, when he walks down the halls of our homes, and looks in our windows, what is our defense? THE WORD! God is able. God loves us. No weapon forged against us will prosper. Oh, there will be weapons forged and we may get wounded, but it won’t be a mortal wound. It won’t kill us. The enemy doesn’t have that power. Right now I’m stressing about buying a $15.00 gift for our group Christmas party. Will they like it? What if no one wants it? Maybe I just shouldn’t go. The enemy trying to get in. No! Jesus has this covered and the Holy Spirit will guide and I will have fun. Why? Because He loves me. Amen. Amen! Your insights and images bless us all. Thank you, Betty! Keep living, loving, growing, sharing. He speaks deep truths to us through you.